« The London Underground – Can I walk it? 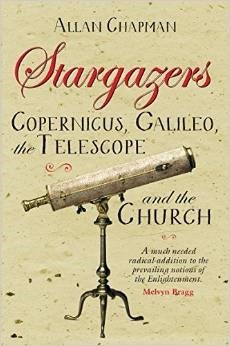 It’s been a while since my last book review here but I’ve just finished reading Stargazers: Copernicus, Galileo, the Telescope and the Church by Allan Chapman. The book covers the period from the end of the 16th century, the time of Copernicus and Tycho Brahe, to the early 18th century and Bradley’s measurement of stellar aberration passing Galileo, Newton and others on the way. Conceptually this spans the full transition from a time when people believed in a Classical universe with earth at its centre, and stars and planets plastered onto crystal spheres, to the modern view of the solar system with the earth and other planets orbiting the sun. This development parallels that in Arthur Koestler’s classic book "The Sleepwalkers”, however Chapman’s style is much more readable, his coverage is broader but not so deep. Chapman introduces a wealth of little personal anecdotes and experiments. For instance on visiting Tycho Brahe’s island observatory he recounts a meeting with a local farmer who had in his living room a marked stone from the Brahe’s observatory (which had been dismantled by the locals on Brahe’s death). Brahe was hated by his tenants for his treatment of them, a hate that was handed down through the generations. Illustrations are provided in the author’s own hand, which is surprisingly effective. He discusses his own work in reconstructing historical apparatus and observations. Astronomy was an active field from well before the start of this period for a couple of reasons: firstly, astrology had been handed down from Classical times as a way of divining the future. To was believed that to improve the accuracy of astrological predictions better data on the locations of heavenly bodies over time was required. Similarly, the Christian Church required accurate astronomical measurement to determine when Easter fell, across increasingly large spans of the Earth. The period covered by the book marks a time when new technology made increasingly accurate measurements of the heavens possible, and the telescope revealed features such as mountains on the moon, sunspots and the moons of Jupiter visible for the first time. Galileo was a principle protagonist in this revolution. Amongst scientists there is something of the view that the Catholic Church suppressed scientific progress with Galileo the poster boy for the scientist’s case. Historians of science don’t share this view, and haven’t for quite some time. Looking back on Sleepwalkers, written in 1959 I noted the same thing – the historians view is generally that Galileo brought it on himself in the way he dismissed those that did not share his views in rather offensive terms. Galileo lived in a time when the well-entrenched Classical view of the universe was coming under increased pressure from new observations using new instruments. In some senses it was the collision with the long-held Classical view of the universe which led to his problems, the Church being more committed to this Classical view of the physical universe rather than to anything proposed in Scripture. The role of the Church in promoting, and fostering science, is something Chapman returns to frequently – emphasising the scientific work that members of the Church did, and also the often good relationships that lay “scientists” of different faiths had with Church authorities. Chapman introduces some of the lesser known English (and Welsh) contributors to the story. Harriet who made the earliest known sketches of the moon. The Lancashire astronomers, who made the first observations of the transit of Venus. John Wilkins whose meetings were to lead to the foundation of the Royal Society. He also notes the precedent of the Royal College of Physicians, formed in 1518. The novelty of the Royal Society when compared with earlier organisations of similar character was that the Fellows were responsible for new appointments, rather than them being imposed by a patron. This seems to have been an English innovation, repeated in the Oxbridge colleges, and Guilds. Relating to these English astronomers was the development of precision instruments in England. This seems to have been spurred by the Dissolution of the monasteries. The glut of land, seized by Henry VIII, became available to purchase. The purchase of land meant a requirement for accurate surveying, and legal documents. Hence an industry was born of skilled men wielding high technology to produce maps. I was distracted by the presence of Martin Durkin in the acknowledgements to this book, he was the architect of “polemical” Channel 4 documentary “The Great Global Warming Swindle”, so it cast doubt in my mind as to whether I should take this book seriously. On reflection Chapman’s position as presented in this book seems respectable, but it is interesting how a short statement in the acknowledgements made me consider this more deeply. 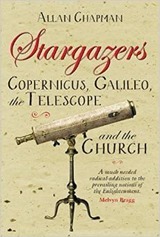 Overall, Stargazers is rather more readable than Sleepwalkers, not quite so single-tracked in it’s defence of the Catholic Church as God’s Philosophers and a different proposition to Fred Watson’s book of the same name, which is all about telescopes.